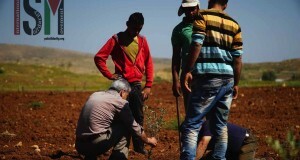 On the 3rd of July 2013, settlers from the illegal colony of Shilo bulldozed land belonging to Qaryut, destroying around two hundred recently planted olive trees. Citizens of Qaryut are now concerned that new houses for the illegal settlement are being built on this stolen land. 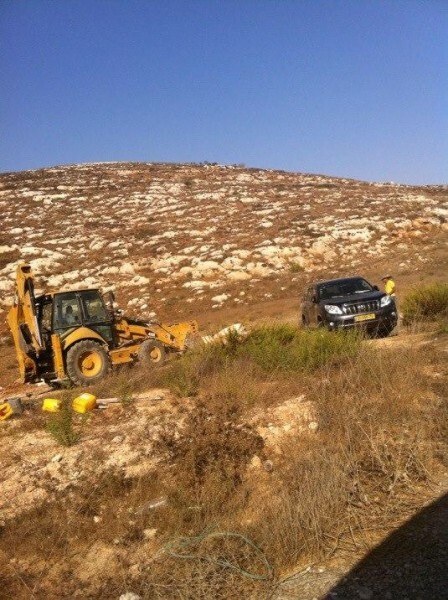 At around 10am, five settlers with a bulldozer entered onto Qaryut land near to their illegal settlement, bulldozing several dunums of land and destroying around two hundred young olive trees planted recently by the landowners. Two jeeps full of heavily armed Israeli soldiers also accompanied the settlers onto the land. 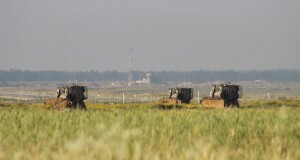 The illegal settlement of Shilo is built on land belonging to Qaryut, and the land surrounding the colony also belongs to Palestinian villagers. Although the people of Qaryut have ownership papers for this land, they say that one of the settlers also has forged papers, stating that it is his land. The Qaryut land next to the settlement is considered by the Israeli authorities Area C, meaning that it is under Israeli control for both civil and security matters; this means that it is not possible for Palestinians to build there, nor to expand their village. On the other hand, the settlers from the illegal settlement of Shilo are regularly granted access to build and expand their colonies onto Palestinian land – this is the case across the West Bank. 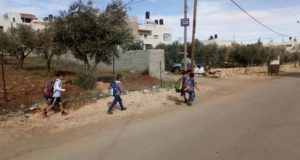 In recent years Qaryut has suffered many problems from the various settlements which surround it, including a case of a a thirteen year old boy who was shot at by settlers from Eli colony. He broke his leg as he ran from settlers and was arrested and tortured by soldiers. In other cases, settlers have set fire to Palestinian land, destroying agricultural land, crops and trees.